Just as many others, I too was “thrown a rope to land” by the influence of Clive Staples Lewis. It seems like another lifetime ago when I was preparing for the ministry--yet struggling with doubts and questions about Christianity. Providence put a small book in my hands one night, and it dealt a mortal blow to my doubts. The book was Mere Christianity. I didn’t read it that night. I drank it in. It is hard not to be a cynic. We live in a skeptical age, when students are trained to doubt everything held out as true. I know that a healthy skepticism is the root of all discernment. But discernment is used to finally ferret out a truth on which to stand. No, ours is an age that viciously deconstructs every truth claim. People refuse to believe anything based on authority.I admit it’s a mess. 3. They are both wrong. They both can’t be right, unless they agree on a truth--and then the ratings go down.In this crazy world, some can actually believe that two different things are the same. Thus, we have an organized, institutionalized madness.Others just throw their hands up and conclude that nothing matters.The madness and the cynicism are killing us. Let me encourage the reader. Don’t give up on truth--especially spiritual truth. We have been blessed with authorities to help us find it.Choose them wisely. 1. C.S. 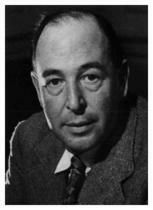 Lewis, Mere Christianity (New York: Collier, 1952), 63-64. I recommend frequent visits to The Window in the Garden Wall. The blogger, whoever he or she is, simply posts a quotation from CSL every day.